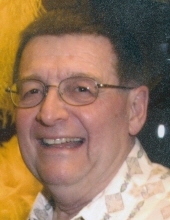 Calvin Dewey Kimberly, 79, passed away January 22, 2019 in Humble, Texas. He was born in Oakland, Iowa, to parents James and Estella Kimberly on June 19, 1939. Calvin retired from Central National Insurance after 37 years of dedicated service where he was the Assistant Vice President of Data Processing Management. Prior to serving his country in the United States Marine Corps, he worked for Western Electric. Calvin is preceded in death by his parents; his sister, Doris Virginia Deras; and brother, Kenneth Sidney Kimberly. He is lovingly survived by his wife, Bonnie Joy Kimberly, who was affectionately known as “Bunny” by Calvin; children, Thomas Sidney Kimberly Harris and husband Paul Allen Harris, Michael Dewey Kimberly Sr. and wife, Stephanie Lynn, Leslie Ann Khalilian and husband, Kambiz; grandchildren, Amy Belvin, Joshua Deel, Heather Deel, Emilie Kimberly, Michael Kimberly Jr., Margaret Kimberly, Mitra Khalilian, Cyrus Khalilian, Camron Khalilian, Kiyan Khalilian; great-grandchildren, Cash Townley, Rhett Belvin, Andalynn Belvin; as well as numerous nieces, nephews, extended family and friends. The family invites you to join them for a visitation on Friday, January 25, 2019 from 3:00 P.M. to 4:00 P.M. at Carter-Conley Funeral Home with funeral services to immediately follow 4:00 P.M. There will also be a fellowship dinner from 5:00 P.M. to 6:00 P.M. in the reception room of Carter-Conley Funeral Home. Interment with military honors will be held at 11:15 a.m. Tuesday, January 29, 2019 at Houston National Cemetery under the direction of Carter-Conley Funeral Home. To send flowers or a remembrance gift to the family of Calvin Dewey Kimberly, please visit our Tribute Store. A time for fellowship and dinner will follow from 5:00 p.m. to 6:00 p.m. in the reception room at Carter-Conley Funeral Home. "Email Address" would like to share the life celebration of Calvin Dewey Kimberly. Click on the "link" to go to share a favorite memory or leave a condolence message for the family.